Images from video surveillance taken at the crime scenes, courtesy San Diego Crime Stoppers. A 22-year-old man suspected of carrying out three East County commercial robberies during which he threatened one employee with a hatchet and shot a BB gun at several others turned himself in Tuesday. Randall Lee of Lakeside surrendered at the sheriff’s Santee Station about 3 p.m., less than six hours after authorities released a wanted poster bearing photos of the armed bandit responsible for the crimes, sheriff’s Sgt. William Amavisca said. 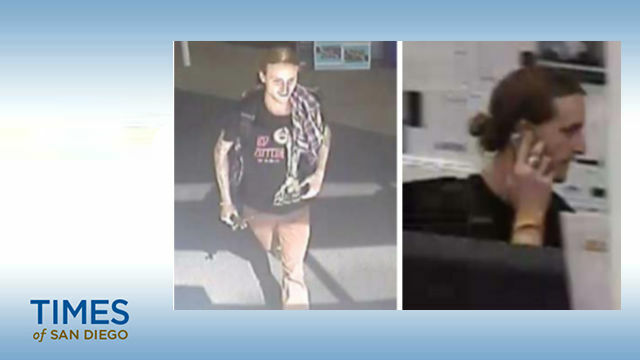 Lee allegedly pulled a hatchet on a loss-prevention officer on Feb. 28 and fled after shoplifting a camera from a Best Buy store on Fletcher Parkway in La Mesa. Shortly after midnight on March 12, the suspect allegedly fired a BB pistol at a manager at a Walmart on Camino Canada in El Cajon while trying to steal two long-barreled BB guns. Lee allegedly fired a BB gun toward an assistant manager at a Walmart on Town Center Parkway in Santee about 11 p.m. the same day, striking another employee in the shoulder, authorities said. Lee was expected to be booked into county jail on suspicion of burglary, robbery, assault with a deadly weapon and brandishing a replica gun, Amavisca said.